"Yoga is the stilling of the fluctuations of the mind"
We are delighted to announce the addition of yoga to the Saint Trainer's services thanks to our collaboration with the wonderful Hayley Rowlands and Nisha Ayres. ​ Hayley and Nisha offer english speaking yoga sessions for those of us looking for a moment of calm in our hectic, Parisian lives. Traveling to your prefered location, they lead peaceful (or dynamic) sessions in the privacy of your own home. Hayley Rowlands is a fully certified RYT 200 hour yoga teacher. To gain her certification, Hayley travelled to India – the birthplace of yoga – and completed an intensive teacher-training course with The Himalaya Yoga Valley Centre in Goa. She was born in South Wales, UK, and currently resides in Paris, France. Hayley first came to Paris to work as a professional dancer, and fell in love with the city and its openness to the artistic side of life. Her career as a professional dancer has now spanned 12 years, and she feels fortunate to have worked internationally for over a decade. 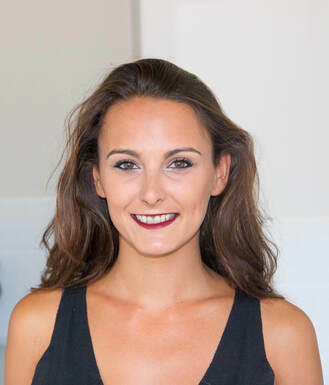 Hayley combines her extensive knowledge of dance and yoga, to ensure her students’ movements are precise, whilst utilizing a range of breathing techniques to achieve calmness. Hayley always fosters a relaxed, non-judgmental environment. As well as Hatha, Vinyasa Flow and Ashtanga, Hayley also specializes in Pregnancy Yoga. As a new mother herself, Hayley knows first hand how beneficial prenatal and postnatal practice can be. ​Using tools such as meditation, visualization and breathing techniques, pregnancy yoga will help you connect with your unborn baby, and prepare you for birth. Focusing on nurturing yourself and the body within. "Through promoting harmony between the body, mind and spirit, I am extremely committed to helping others to thrive. I endeavour to lead a challenging and focused practice, tailoring it to suit my students’ individual needs and abilities." 1 to 1 yoga classes in the comfort of your own home in either Hatha, Ashtanga or Vinyasa flow style. Born in Devon, UK, Nisha is a British Yoga teacher who earned her RYT 200 hour yoga teacher training in Rishikesh (India), the birth place and world capital of Yoga. She began practicing yoga and instantly recognised the numerous benefits this lifestyle has to offer. She trained extensively in dance from a young age, which lead her to perform as a professional dancer for 9 years all around the world. Her career took her to the French capital to continue performing, this time in the infamous Parisian cabarets. Her passion for dance and movement linked a natural transition to the wonderful world of yoga. "I create a safe, non-judgemental space for my students. I have a strong passion to teach yoga and enjoy helping to bring balance, awareness, health and happiness into others lives." Nisha's classes offer creative sequences with intentional themes, emphasising the importance of proper alignment of the body along with pranayama breathing techniques. Hatha is a form of yoga emphasising a system of physical postures for balancing, stretching and strengthening the body. Vinyasa is a style of yoga characterised by linking postures together moving seamlessly from one to another using and practicing rhythmic breathing. Nisha designs classes that allow students to step off the mat feeling refreshed, nourished and balanced.